محرک های تنش زا اثرات متفاوتی بر سلامتی، تصمیم گیری، خلاقیت، حافظه و یادگیری دارند. شناخت حالات روانی انسان نظیر تنش روانی، می تواند در جلوگیری از اثرات طولانی مدت آن بر جسم و روان موثر باشد. این مطالعه با هدف ارزیابی نقش سلول های عصبی هرمی CA1 هیپوکامپ مغز در هنگام تنش روانی انجام شده است. در این تحقیق با کمک نقشه شناختی مغز در حالت تنش روانی، نحوه اثرگذاری دو سیستم عصبی و هورمونی در بدن بررسی شده است؛ سپس با کمک معادلات الکتروفیزیولوژیکی به شبیه سازی رفتار کانال های کلسیمی سلول CA1 در نرم افزار نرون پرداخته شده است. از نتایج می توان دریافت در هنگام تنش، هورمون های گلوکوکورتیکوئید ترشح شده از قشر غده فوق کلیه خود را از طریق جریان خون به هیپوکامپ رسانده و با فعال کردن گیرنده های گلوکوکورتیکوئیدی، دینامیک کانال های کلسیمی خصوصا نوع L را تحت تاثیر قرار داده و ورود کلسیم را به داخل سلول های CA1 افزایش می دهند. این رفتار گواهی بر کاهش نرخ خروج کلسیم داخل تنه سلولی است که به کاهش نمایی نرخ آتش سلول، کاهش تعداد خیزک ها و افزایش در دامنه جریان sAHP منجر می شود. جریان های کلسیمی نوع L ناحیه هیپوکامپ، از سازوکار های موثر در هنگام تنش به شمار آمده و با مقایسه نتایج تحقیق در دو حالت سلول تحت کنترل و تنش، مشاهده می شود مدل توانسته با برخی از مشاهدات پایه ای تنش، همخوانی داشته باشد. Various stressful stimuli have different effects on health, decision making, creativity, learning and memory. Understanding human mental states such as stress can prevent its long-term side effects on the body and mind. This study deals with the responses of the neural and hormonal systems to stress using the brain cognitive map in this state and simulates the behavior of the CA1 cell calcium channels with electrophysiological equations in the NEURON software. During stress, the glucocorticoids hormones secreted by the adrenal gland cortex reach the hippocampus through blood flow and by activating glucocorticoids receptors, influence the calcium channels dynamics, especially the L-type and increase calcium entry into CA1 cells. This behavior, testify to the reduction of the calcium removal rate in the cells which leads to exponential decrease in cells firing rate and number of spikes and an increase in the sAHP current range. L-type calcium currents in hippocampus region are effective mechanisms during stress. Comparing the research results in two situations, the cell under control and the cell under stress, shows that the model is consistent with some basic observations of stress. Ismail A., Yao A., Yeop-Yunus N.K., Relationship between Occupational Stress and Job Satisfaction: An Empirical Study in Malaysia, The Romanian Economic Journal, 2009; 34 (4): 3-29. حسینی سید عابد، کمی سازی سیگنال های مغزی EEG به منظور ارزیابی سطح استرس روانی، پایان نامه کارشناسی ارشد مهندسی پزشکی بیوالکتریک، دانشگاه آزاد اسلامی، واحد مشهد، آبان 1388. Sidiropouloua K., Joelsb M., Poirazi P., Modeling stress-induced adaptations in Ca2+ dynamics, Neurocomputing, 2007; 70: 1640–1644. Joëls M., Functional actions of corticosteroids in the hippocampus, Review, European Journal of Pharmacology, 2008; 583: 312–321. Liebmann L., Karst H., Sidiropoulou K., Van-Gemert N, Meijer O.C., Poirazi P, Joëls M., Differential Effects of Corticosterone on the Slow Afterhyperpolarization in the Basolateral Amygdala and CA1 Region: Possible Role of Calcium Channel Subunits, Journal of Neurophysiol, 2008; 99: 958–68. Wu W.W., Oh M.M., Disterhoft J.F., Age-related biophysical alterations of hippocampal pyramidal neurons: implications for learning and memory, Ageing Research Reviews, 2002: 181–207. Kim J., Diamond D.M. The stressed hippocampus, synaptic plasticity and lost memories. Nature Reviews, Neuroscience, 2002; 3: 453-62. Hosseini S.A., Khalizadeh M.A., Homam S.M., Azarnoosh M., A Cognitive and Computational Model of Brain Activity during Emotional Stress, Journal of Advances in Cognitive Science, 2010; 12 (46): 1-14. 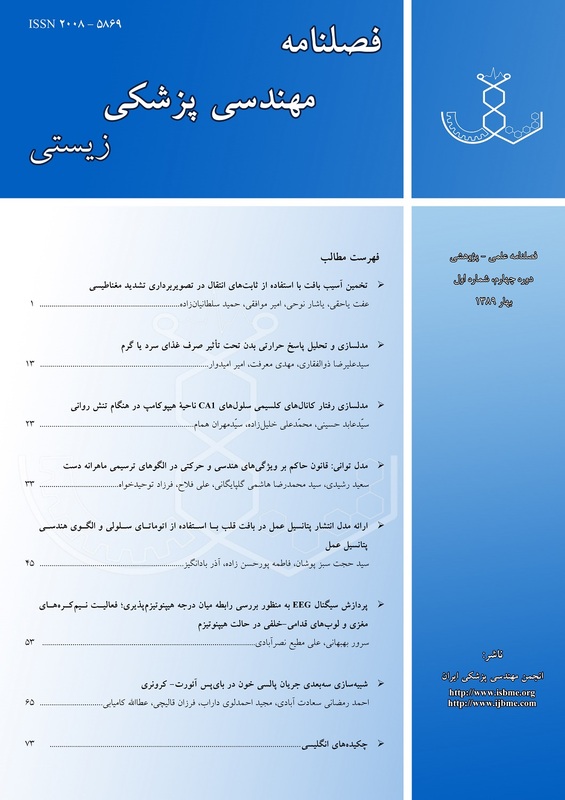 Hafez B., Hafez E.S.E., Stress/Aging: Endocrine Profiles/Reproductive Dysfunction in Men, Archives of Andrology, 2004: 207–238. Shier D., Butler J., Lewis R., Hole’s Essenntials of Human Anatomy and Physiology, McGraw-Hill, 7th_ Edition, 2000. Carey J., Brain Facts, A Primer on the Brain and Nervous System, Society for Neuroscience, USA, 2006. Kloet E.R., Karst H., Joëls M., Corticostroid hormones in the central stress response: Quick-and-slow, Review paper, Neuroendocrinology, 2008; 29: 268-272. گراهام رابرت. بی، روانشناسی فیزیولوژیک، ترجمه: علیرضا رجایی، علی اکبر صارمی، انتشارات آستان قدس رضوی، چاپ سوم، 1384، 395-396. یرنان جان. کی، سیستم عصبی انسان، ترجمه: سکینه غفاریان، علیرضا فاضل، انتشارات جهاد دانشگاهی مشهد، چاپ اول، 1385، 418-421. Kandel E.R., Schwartz J.H., Jessel T.M., Principles of Neural Science, McGraw Hill, 4th Edition, 2000: 232- 233. Welling A., Voltage-Dependent Calcium Channels, Biotrend Reviews, 2009; 4: 1-12. Markaki M., Orphanoudakis S., Poirazi P., Modelling reduced excitability in aged CA1 neurons as a calcium dependent process, Neurocomputing, 2005; 66: 305– 314. Golding N.L., Kath W.L., Spruston N., Dichotomy of Action-Potential Backpropagation in CA1 Pyramidal Neuron Dendrites, Journal Neurophysiol, The American Physiological Society, 2001; 86: 2998-3010. Poirazi P., Brannon T., Mel B.W., Online Supplement: About the Model, 2003: 1-24. Hines M.L., Carnevale N.T., The NEURON Simulation Environment, Neural Computation, 1997; 9 (6): 1-24. Poirazi P., Brannon T., Mel B.W., Arithmetic of Subthreshold Synaptic Summation in a Model CA1 Pyramidal Cell, Neuron, 2003; 37: 977–987. Kerr D.S., Campbel L.W., Thibault O., landfield P.W., Hippocampal glucocorticoid receptor activation enhances voltage dependent Ca2+ conductances: Relevance to brain aging, Proceedings National Academy Sciences USA, Neurobiology, 1992: 8527- 8531. Vrede Y.V.D., Fossier P., Baux G., Joels M., Chameau P., Control of IsAHP in mouse hippocampus CA1 pyramidal neurons by RyR3-mediated calciuminduced calcium release. Cellular Neurophysiology, 2007; 455: 297–308. Tsubokawa H., Offermanns S., Simon M., Kano M., Calcium-Dependent Persistent Facilitation of Spike Backpropagation in the CA1 Pyramidal Neurons. Journal of Neuroscience, 2000; 20 (13): 4878–84.